The grey skies of mid-October did nothing to dampen the spirits of the 30-strong Our Harbour contingent collecting in Phillips Square. Unified in purpose and sporting burgundy caps and umbrellas provided by the organizers, we merged with the like-minded and -attired members of other mental health organizations to enjoy a short concert. By the time we left with the blocks-long March for Mental Health, everyone was more than ready to raise awareness of the stigma of living with mental illness. 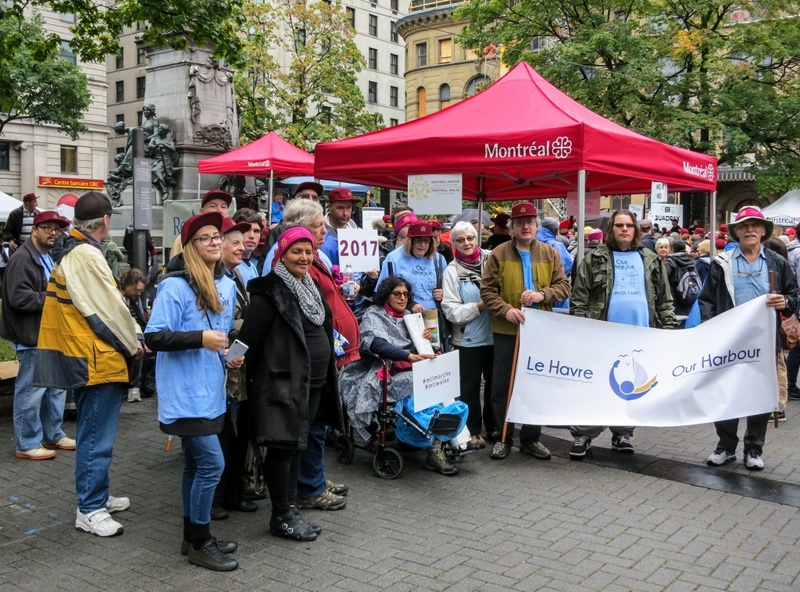 Most of our residents, volunteers and many family members joined our DG Dolly Shinhat, our Coordinator Regine Bouzi and stagiaire Elina Pojar for the 3-kilometer stroll through central Montreal.